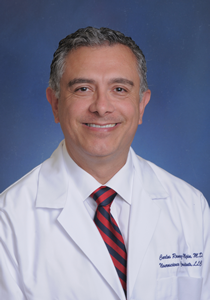 Carlos Ramirez-Mejia, MD is board certified by the American Board of Psychiatry and Neurology. He is proficient and fellowship trained in Epilepsy, Electroencephalography, Intra-operative Monitoring, Sleep Medicine, Nerve Conduction Studies, Electromyography, Therapeutic BOTOX, Neurophysiology and Vagal Nerve Stimulator. Dr. Ramirez-Mejia earned his medical degree from Caldas University. He was a researcher in the area of immunology and molecular biology at Georgetown University and at the Naval Medical Research Institute in Bethesda, MD. Later on, he was a Research Associate at the Neuro-Toxicology Laboratory at the Georgetown University Medical Center. He did his Internal Medicine internship at George Washington University in Washington, DC. Dr. Ramirez-Mejia completed the specialty training in Neurology at Georgetown University, where he was Chief Resident. He also served as Chief Resident at the Veterans Affairs Medical Center in Washington, DC. After completing a year as an instructor of Neurology and a fellowship in Neurophysiology, Epilepsy and Sleep Disorders at George Washington University, he relocated to Miami to join The Neurological Center of South Florida. Dr. Ramirez-Mejia is a member of the American Academy of Neurology, The American Headache Society, The American Academy of Sleep Medicine and the International Headache Society. Dr. Ramirez-Mejia is a regular guest on television shows and syndicated newspapers, talking about health and wellness and is the coauthor of published research articles. He is an international lecturer and faculty member of international scientific conferences. Dr. Ramirez-Mejia is a native of Colombia and was awarded “the Key to the City of Cartagena” as Illustrious Citizen. He received the most prestigious government award for a Colombian physician: The Fleix Henao Toro Medal by the governor of the Department of Caldas. He also has received awards from Colombian civic organizations, the Secretary of Culture, Journalism Organization and the Lions Club. Carlos Ramirez-Mejia, MD is a neurologist located in Miami, Florida. You can contact his office at (305) 595-4041.